This blog post is in English as you may have noticed. It is made for a training session held at Södertörn University for the Swedish media organizations. Create a network visualization of one's Facebook friends. First here are some of examples where network analysis has given insigth to the given story. As you can see network visualizations can be used in various ways. They can be used both in the background and also as an interactive end user application. But only your own Facebook friends data is available through the API. So if you desire to get the friends data of any other profile it is vital to know that it is not available through Facebook API. So if you want to make a social network analysis of your friend's Facebook friends you need to make a little detour. The detour here is called screen scraping. Screen scraping is a method where we use the computer to read the data what we see on our screen. We do this while computers are much faster doing it and make less mistakes. 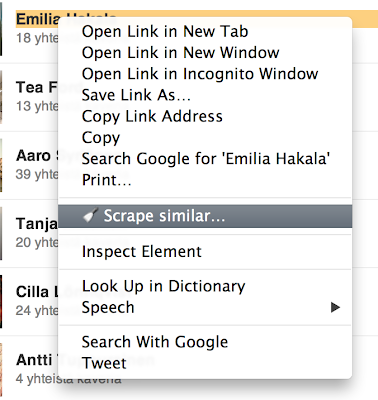 At simplest screen scraping is done from one page but it can be done from any number of pages. A tool called Scraper is a very good for doing this when we just need to scrape data from one to two pages. 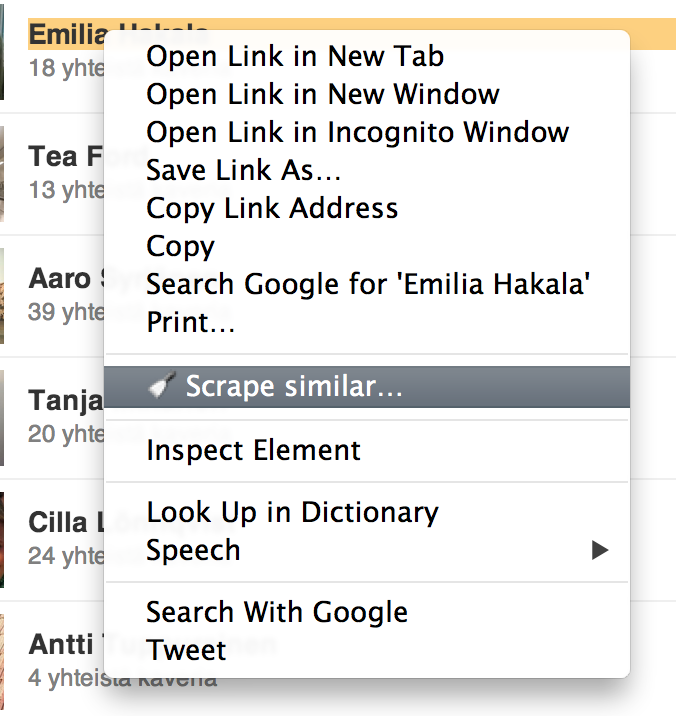 Scaper is Google Chrome addon. if you desire to know more see a tutorial by Jens Finnäs. For scraping we will use Facebook's mobile interface while it has much simpler outlook. 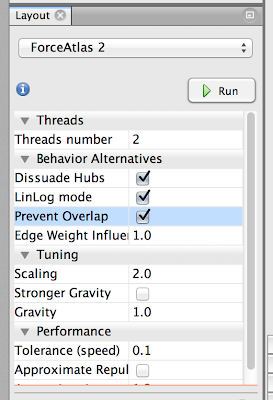 This is nice when doing screen scraping because we have to deal with less code. The following steps allow you to screen scrape your own friends list (that was also available through the API). First scroll down as many times you need to get all of your friends to show on the screen. To achieve this it is quite handy to used the pagedown functionality. You may experience problems if you have more than 500 friends or so. To define what you are looking for you need to use either XPath or jQuery. The default selection is XPath and that suits us. Enter the following code without the quotes into the available field "//div[@class='_4mn c']/a" and click Scrape. What the code says is that we want to get the anchor elements (aka. 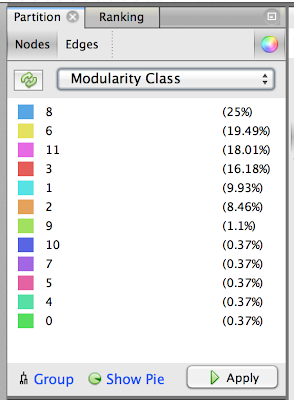 links) which are located under a <div>-element which has class attribute value "_4mn c". In the section columns set XPath to "@href". 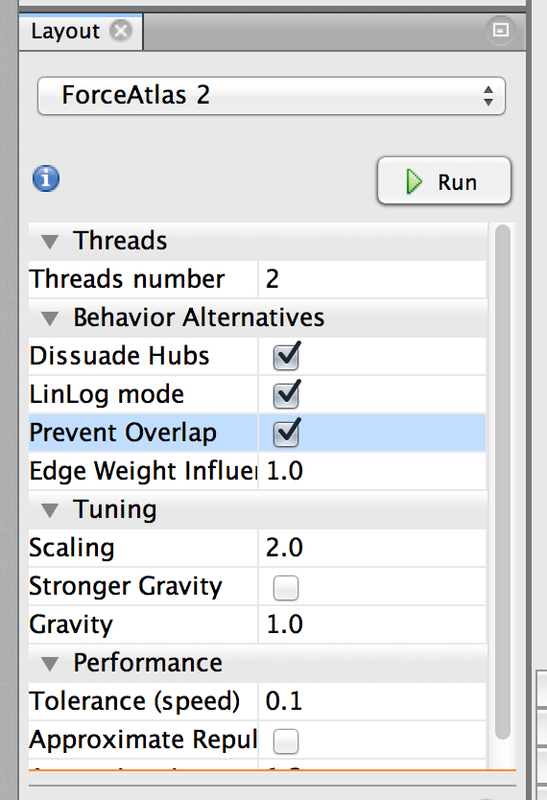 That tells the code to fetch the @href parameter from those anchors. 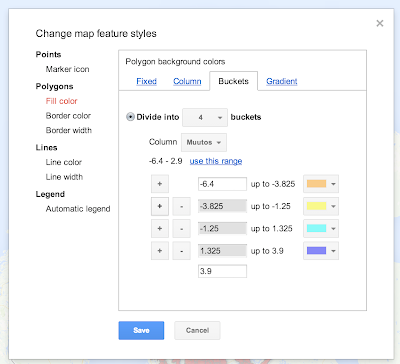 Export the dataset to Google Docs and open the document in Google Docs. 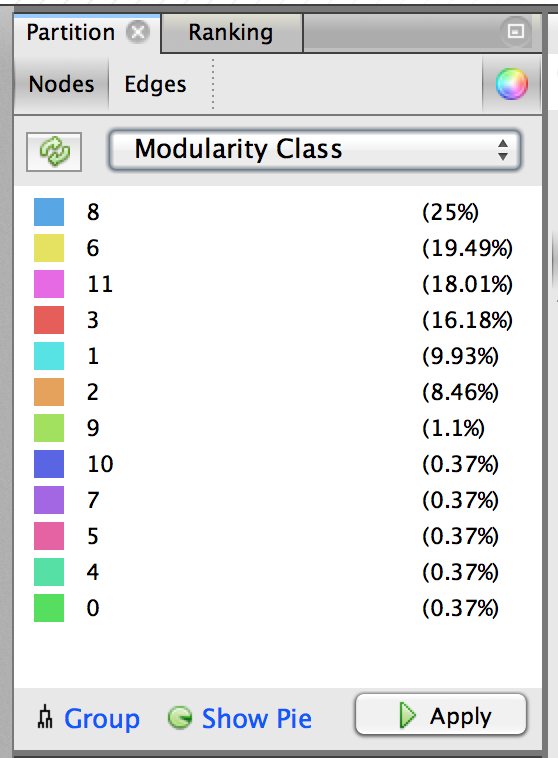 Remove unnecessary columns B to E.
Now we have a .csv-file of all your friends. From this we could make a network visualization which would show that all your friends are connected to you. What we want to do is to figure out how your friends are connected which each other. This can be accomplished via Facebook API's Friend property which allows us to ask wheater to Facebook profiles are friends with each other. This is nice while you can do this for any two Facebook profiles regardless of their privacy settings. Key point here is that one can't ask Facebook API who are all the friends of a Facebook profile. But one can ask one-by-one wheather to profiles are friends. So if you have a list of Facebook profiles it is possible to make the network. And as you may have realized we have list while we have screen scraped it. This also means that sometimes you can't get the profile list you deside due user's privacy settings. For example users can hide their friends list from users that they have not friended. But how to use the Friend property. One can access it via Graph API Explorer which we already used to acquire the proper access token. "SELECT uid1 FROM friend WHERE uid2 = 635279474 AND uid1 = 732028610"
Fortunately this is not the case. I have written a Python script that does the work for us. But unfortunately I'm quite sure that the script won't work out of the box for most users. The script runs for a while. First it fetches all the metadata available from the profiles. After that the script forms the connecions between the users. After all is done the script outputs the data into a network file format. 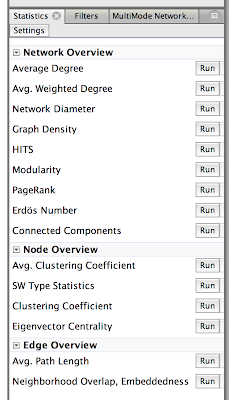 Now that we have the data in a network format (.gexf) we can visualize it with available tools. 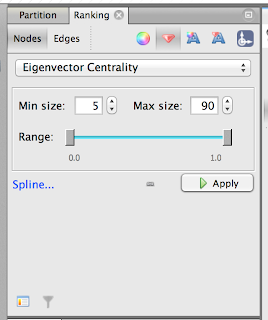 One great and free tool is called Gephi. 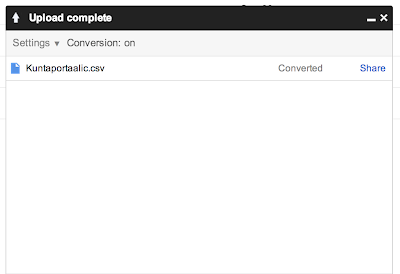 If you failed to form your own dataset you can download and example dataset. Without adjusting any settings we don't get much out of the data. We can zoom into it and point single nodes to see the edges leaving from it but that is just it. 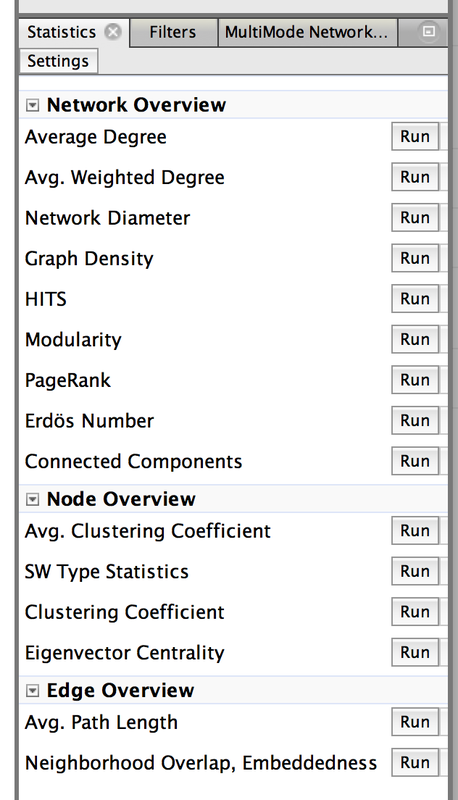 What we need to do is to define the layout algorithm, the node size and the color values for the nodes to get more out of the data. After you hit run you'll see the magic happening in just a few seconds. The nodes are settled in the network based on the edges between them. Meaning that the nodes which have more connections between each other are grouped closer to each other and the nodes that have less connections to each other are torn apart. You are all done. 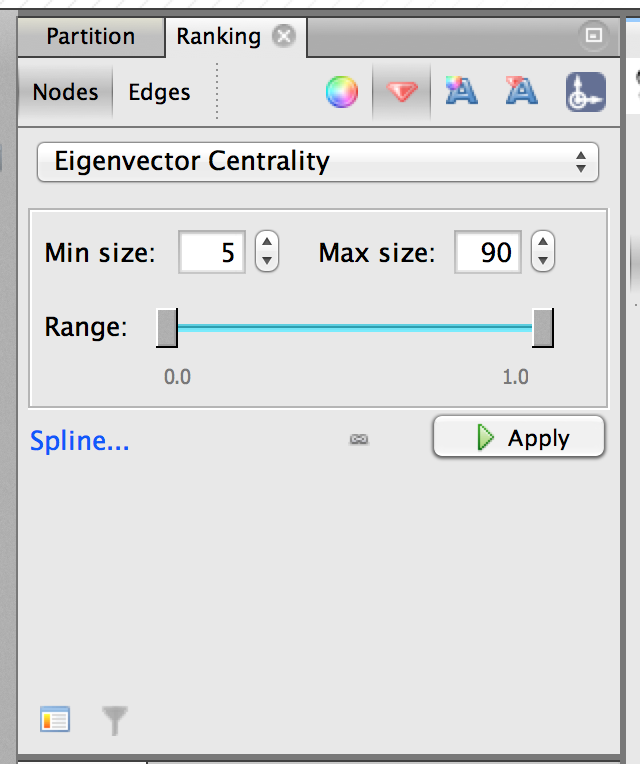 You may adjust your colors and nodes sizes. You can test for example to use the gender information to define the colors. You can also try other layout algorithms to see what is available. See also Olli Parviainen's great slides about visualizing your Twitter network with Gephi. 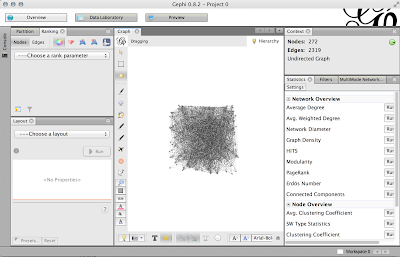 Slides 8 to 17 show you the main visualizing steps inside Gephi that we've also used here. 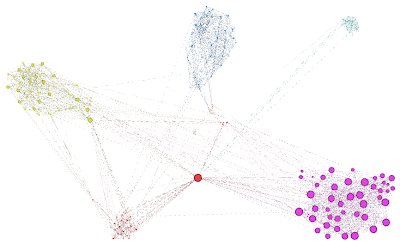 Using network visualizations to show the connections between your Facebook friends or social media connections in general is a great way to make insight. Network visualizations are not that familiar way of visualization for a common user. Not like bar charts or maps. People tend not to understand what they are about and call them these odd spyderweb visualizations. From this perspective I am not that eager to publish them online. But for professionals like journalists and programmers network visualizations can give real good insigth into the data. Knowing how to do network visualization gives you most often an unique perspective that no one else have thought of. 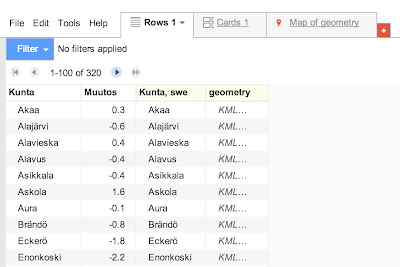 Tämän blogikirjoituksen tehtävä on näyttää askel askeleelta miten yksinkertaisen karttavisualisoinnin toteuttaminen onnistuu Google Fusion Tables -työkalulla. Ohjeet on alunperin kirjoitettu Metropolia:n opintojakson "Toimittaja verkkomediassa" tarpeisiin, mutta ne on kirjoitettu niin, että kuka vain voi niitä seurata. Kuntiin liittyvää dataa on saatavilla hyvin monista eri lähteistä. Esimerkiksi THL:n Sotkanet tarjoaa hyvin monipuolisesti erilaista terveyteen liittyvää tietoa. Toinen laaja tietolähde on tietysti Tilastokeskus. Esimerkiksi voit ladata kuntadataa Tilastokeskuksen Kuntien avainluvut -aineistosta. Valitse vasemmalta kaikki kunnat niin, että valituksi tulee 320/321 riviä. 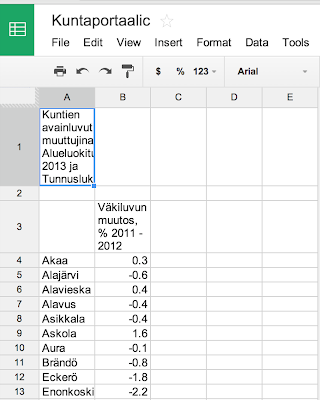 Valitse oikealta haluamasi tunnusluku, voit ottaa esimerkiksi "Väkiluvun muutos, % 2011 - 2012". Valitse pudotusvalikosta valinta "Pilkkueroteltu otsikolla (.csv)". 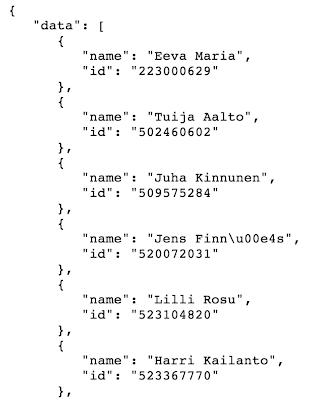 Paina "Jatka" ja lataa valitsemasi data tietokoneellesi johonkin mistä löydät sen hetken päästä. Lisää Valitse kaikki kunnat, haluamasi tunnusluku sekä haluttu dataformaatti. Nippelitietoina on hyvä tietää, että vuosina 2011–2012 Suomessa oli 336 kuntaa kun taas vuonna 2013 Suomessa on 320 kuntaa. Aineistossa olevien kuntien määrä kertoo usein siitä miltä ajalta aineisto on. Joskus on myös hyvä tietää, että vuosina 2011–2012 Suomessa oli 320 kuntaa mannersuomessa, koska tämä voi joskus olla hämäävää. 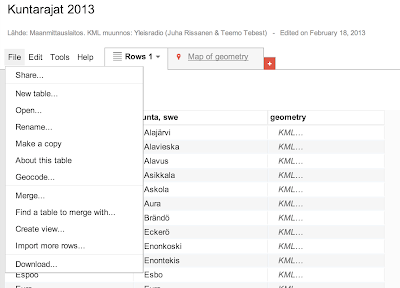 Seuraavaksi haluat siirtää hankkimasi aineiston Google Drive -pilvipalveluun, koska Fusion Tables on sieltä löytyvä työkalu. Tätä ennen data täytyy kuitenkin puhdistaa. Käytämme myös tähän puhdistamiseen Google Drive -palvelua. Mene osoitteeseen http://drive.google.com ja kirjaudu sisään omilla Google-tunnuksillasi. Näet näkymän jossa ovat kaikki Google Drive -tiedostosi. Jos et ole käyttänyt palvelua aikaisemmin saatat saada tervetulotoivotuksia ja muita viestejä. Valitse vasemmalta löytyvä punainen upload-painike (nuoli ylöspäin). 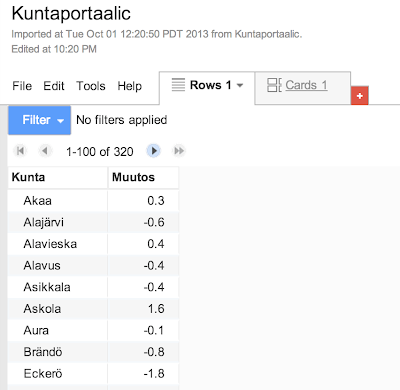 Etsi koneellesi aiemmin lataama .csv-tiedosto ja lataa se Google Drive -palveluun. Jos kaikki on tähän asti onnistunut pitäisi lopputuloksen näyttää tältä. Toki jos olet valinnut hyvin eri tyyppisen datan näyttäytyy se tietysti eri tavalla. Mikäli jotain tuntuu menevän väärin eikä lataamastasi dokumentista synny yllä olevan kaltaista taulukkolaskentadokumenttia kokeile ladata .csv-tiedosto uudelleen ja tarkista latausikkunan asetukset. Haluat, että sinulla on "Conversion; on" -asetus päällä. 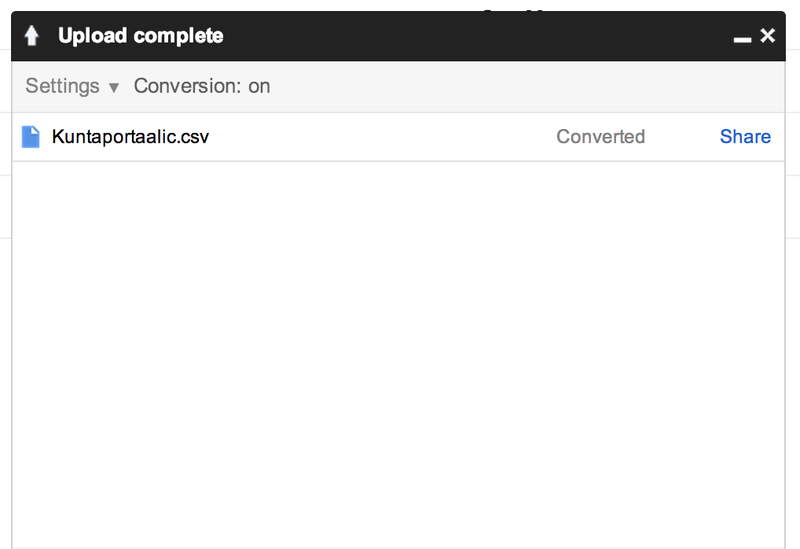 Asetettuasi "Conversion" -asetuksen tilaan "on" täytyy sinun ladata tiedosto Google Drive:en vielä kertaalleen, koska vasta tällöin asetus tulee voimaan uusille tiedostoille. Voit huoletta poistaa kaikki turhat tiedostot ja epäonnistuneet siirrot Drive:stä. Data täytyy puhdistaa ennen kuin sitä voidaan käyttää. Tässä tapauksessa puhdistaminen tarkoittaa, että haluamme muuntaa datan sellaiseen muotoon, että meillä on kaksi saraketta, joista ensimmäisessä sarakkeessa (A) meillä on kunnan nimi ja toisessa sarakkeessa (B) meillä on kuntaan liittyvä lukuarvo, joka siis kuvaa jotain kunnan ominaisuutta. Tässä tapauksessa se siis on kunnan muuttovoitto- tai muuttotappioprosentti. Haluamme myös, että rivillä yksi (1) meillä on otsikkorivi. Eli rivi joka kuvaa sarakkeiden sisällön. Otsikkoriviä seuraa esimerkiksi suomalaisen kuntadatan tapauksessa 320 riviä, jotka kuvaavat kuntien tiedot. On hyvä tarkistaa rivien määrä sekä ettei mukana ole mitään muuta tarpeetonta. Nämä toimenpiteet on mahdollista tehdä kuten missä tahansa taulukkolaskentaohjelmassa. Ensimmäinen rivi on nimeltään otsikkorivi. Se kertoo mitä tietoa sarakkeet pitävät sisällään. Samankaltaista tietoa sisällään pitävät tiedot erotellaan omiksi sarakkeikseen. Käsittelemämme dokumentti on tähän asti ollut Google Spreadsheets -dokumentti. 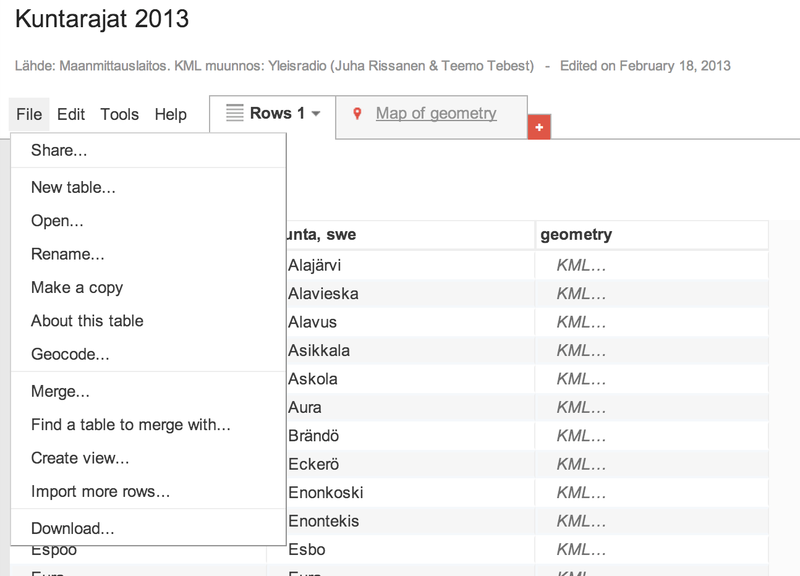 Nyt koska haluamme visualisoida datan Fusion Tables -työkalun avulla kartalle täytyy meidän tallentaa tämä Spreadsheet-dokumentti Fusion Tables -dokumentiksi. Mene Google Drive -palvelun etusivulle. Valitse "Fusion Table". (Mikäli et löydä "Create"-valikon alta Fusion Tables -valintaa täytyy sinun asentaa kyseinen työkalu "Connect more apps" -valikon kautta). 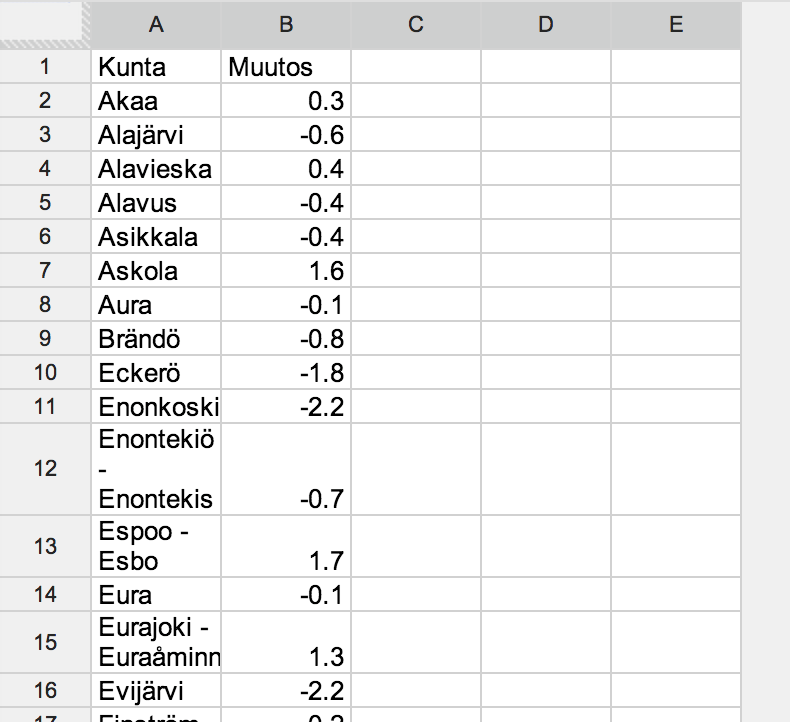 Valitse avautuvasta ikkunasta vasemmalta Google Spreadsheet, hae oikea dokumentti ja valitse se. Esikatseltuasi dokumenttia ja annettuasi sille haluamasi tiedot pääset näkemään lataamasi tiedot. Fusion Tables -dokumentti muistuttaa jossain määrin taulukkolaskentadokumenttia ulkonäöllisesti (sarakkeita ja rivejä), mutta ei kuitenkaan ole sellainen. 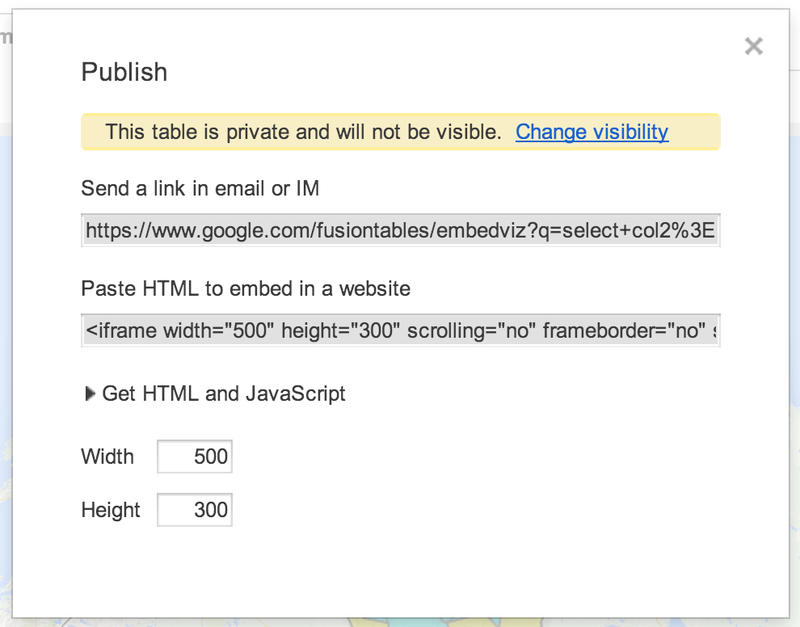 Tärkein ero taulukkolaskentadokumentin ja Fusion Tables -dokumentin välillä on, että Fusion Tables on nimenomaisesti tiedon visualisointityökalu. Sen avulla on siis mahdollista suhteellisen helposti visualisoida olemassa olevaa tietoa. Tietojen muokkaaminen sen avulla on kuitenkin melko tuskallista. 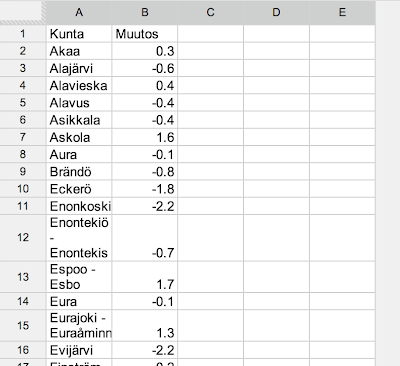 Fusion Tables:ssa esimerkiksi sarakkeiden summaaminen ja muut funktionaaliset toiminnallisuudet loistavat poissaolollaan. 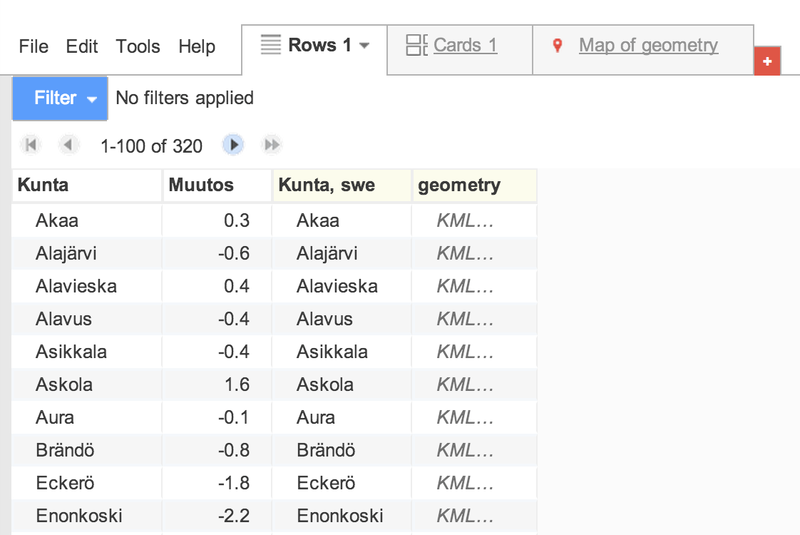 Kannattaa siis ensin muokata data valmiiksi taulukkolaskentaohjelmistossa ja vasta sitten tuoda se Fusion Tables:iin. 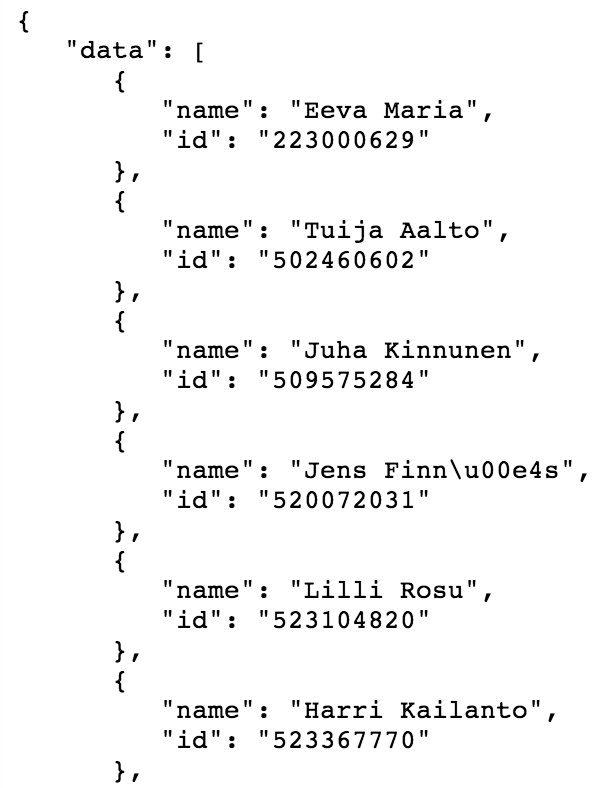 Jotta voit tehdä datastasi Suomen kuntarajoihin perustuvan visualisoinnin täytyy sinulla olla datan lisäksi toki myös Suomen kuntarajat. Lataa dataasi sopivat rajat tämän blogin KML-aineistot sivulta. Esimerkkitapauksessamme oikea aineisto on "Suomen kuntarajat 2013". Voit joko käyttää "Make a copy" -toimintoa tai sitten ladata datan ensin koneellesi ja sitten uutena Fusion Tables -dokumenttina omaan Google Drive:esi. 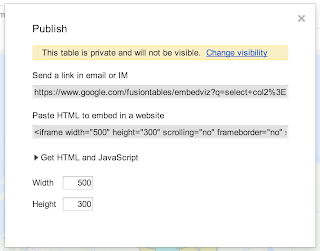 Oleellista on, että saat rajat sisältävän Fusion Tables -dokumentin näkymään omassa Google Drive:ssäsi. 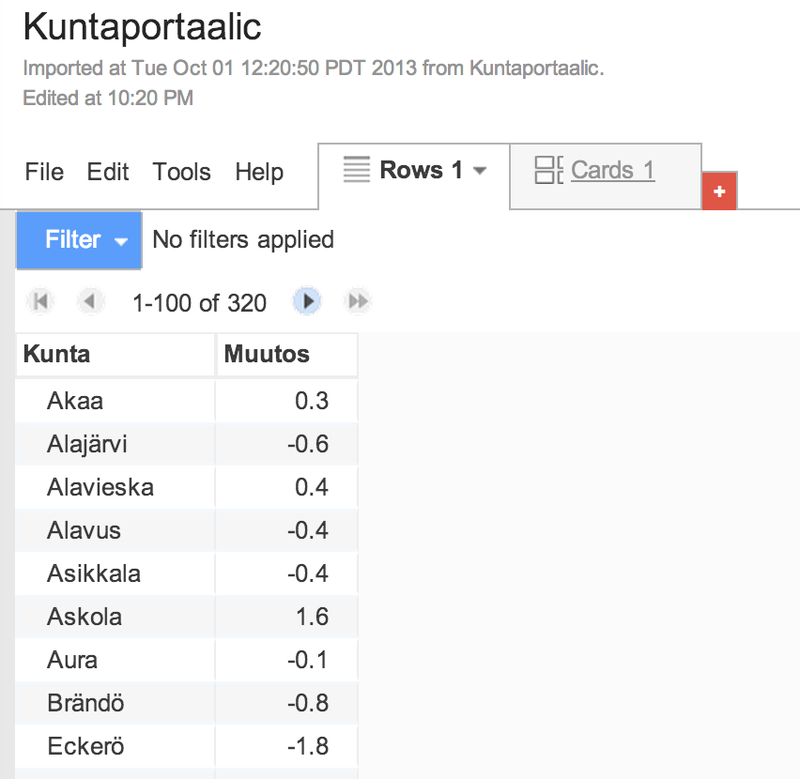 Haluat ladata aluerajat omaan Google Drive:esi. Seuraavaksi haluat yhdistää kaksi dokumenttia toisiinsa yhteisen nimittäjän avulla. Yhteinen nimittäjä on tässä tapauksessa kunnan nimi, joka siis on yhteinen molempien dokumenttien kesken. Avaa kuntadata sisältävä Fusion Tables -dokumenttisi. Valitse File-valikon alta löytyvä Merge-painike. Etsi dokumenteistasi aluerajat sisältävä dokumentti ja valitse "Next". Valitse sarake, jonka perusteella dokumenttien yhdistäminen tehdään. Valitse sarakkeet joissa on toisiaan vastaavat tiedot. Nyt meillä siis on Fusion Tables -dokumentti, joka pitää sisällään niin datan kuin aluerajat. Seuraavaksi haluamme määrittää miltä kartta näyttää. Eli haluamme muun muassa määrittää alueiden värityksen. Valitse "Map of geometry" -välilehti. 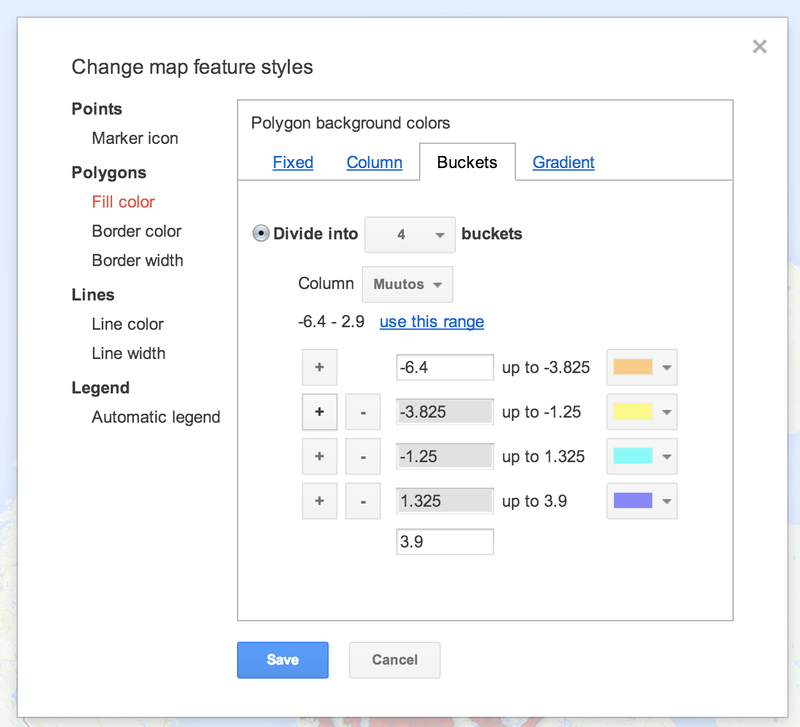 Valitse "Tools" -> "Change map styles...". Määrittele haluamasi värien määrä. Kohdasta "Divide into x buckets". Esimerkiksi 4–6 on usein hyvä arvo. Valitse kohtaan "Column" sarakkeen nimi, jossa on visualisointiin haluamasi data. Tallenna muutokset ja näet tekemäsi muutokset kartalla. Voit muuntaa alueita klikkaamalla näkyvän infoikkunan sisältöä valitsemalla "Tools" -> "Change info windon layout...". Voit valita mitkä sarakkeet näytetään ja myös muokata vapaasti osatessasi infoikkunan html-koodia. Yhdistämisen jälkeen sinulla on uusi Fusion Tables -dokumentti missä on niin hankkimasi data kuin aluerajat. Aluerajat näkyvät kuvassa kohdassa "geometry". Voit vaihtaa raja-arvoja ja värejä haluamallasi tavalla. Näissä valinnoissa tulisi toki julkaistavassa jutussa olla jokin peruste. Mahdolliset tyhjät alueet tarkoittavat sitä, että yhdistäminen alkuperäisen datan ja aluerajadatan välillä ei ole onnistunut kaikilta osin. Tässä tapauksessa syynä on, että kuntien nimen eivät olleet aineistoissa yhteneväiset. Valmiin karttatoteutuksen julkaiseminen onnistuu useimmissa sisällön hallintajärjestelmissä niin sanotun iframe-upotuksen avulla. Saat upotukseen tarvittavan html-koodin valitsemalla "Tools" -> "Publish...". 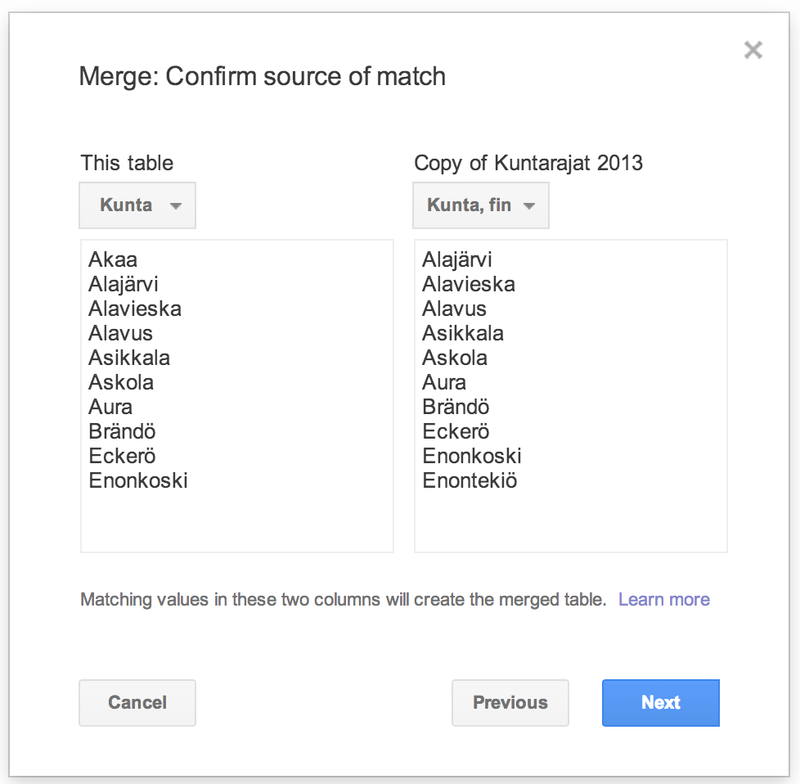 Ennen julkaisua Fusion Tables -dokumentti tulee asettaa näkyväksi Internetissä. Valinta "Everyone with a link" on usein hyvä vaihtoehto. Tämä iframe-koodi upotetaan hieman riippuen sisällöntuotantojärjestelmästä osaksi jutun leipätekstiä, jolloin sen pitäisi toimia kuten tässä. Nämä ohjeet eivät pyri kuvaamaan prosessia täydellisesti vaan on tarkoituksenmukaista, että niitä läpikolutessa joutuu myös ajattelemaan välillä mitä on tekemässä.